A gold perfume holder comprised of a gold square bottle chased with patterns of flowers and crosshatching. Perfume, or attar, was offered within the Indian court to welcome visitors. The four edges of the bottle are decorated with gold modelled flowers and leaves and the stopper is set with emeralds and a diamond, with a gold ladle attached on inside. The bottle is fixed to a gold tray of openwork foliate design with rim set with rubies and emeralds, which is inscribed with the name of the ruler of Wankaner in English. 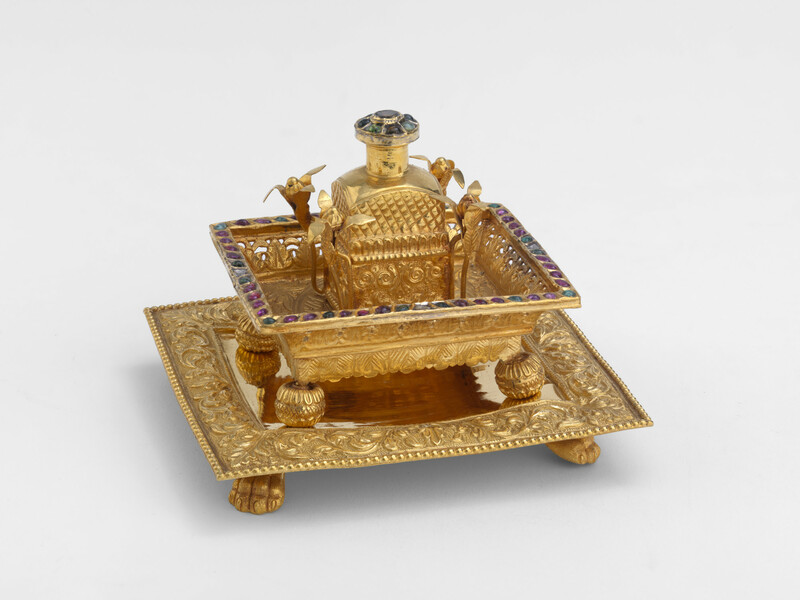 The perfume bottle and accompanying tray is mounted on another tray with a chased foliate border with four feet modelled on tiger or lion paws. A Gujarati inscription of the ruler of Wankaner's name on the centre of this lower tray is obscured suggesting that the upper tray and bottle and lower tray were made separately and attached later, perhaps to make a more impressive gift.